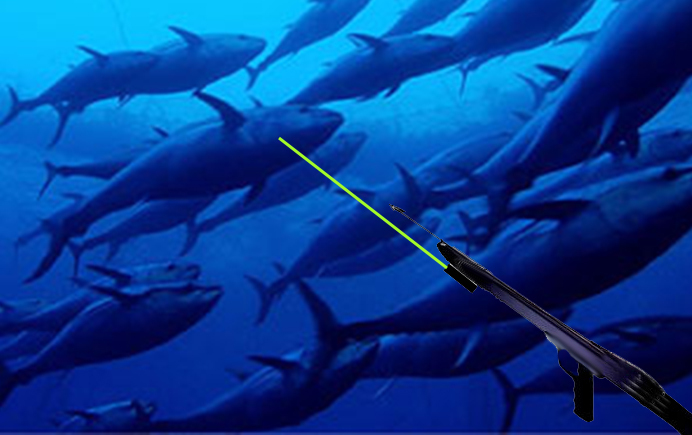 Using supplies found in stores like Home Depot, divers mount the laser on their spear guns to obtain great accuracy. It doesn't have to be pinpoint accurate like a competition rifle because the distance is much less. A couple of practice shots to see where the spear hits in relation to the green spot is all that it takes. Because of the many kinds of spear guns available we don't make the mountings. We have seen many kinds of mountings made from parts purchased at gun shops or stores such as Home Depot. Here is an example of a very fine one made by a scuba diver in our great northwest, enabling him to get quick kills by limiting his hits to head shots. green laser spear gun mount One picture shows the green aiming dot placed on the target by the green laser.